To begin to work for a startup is not that easy as it looks like. Startup jobs are more demanding than what you expect. They have their own ideology and the way they carry out their work is totally opposite to corporate business. Most of the time they are flexible and have open workplace environment. Choosing to work for a startup is a very crucial decision and must evaluated eventually as startups are having challenging environment. However irrespective of the fact that a person is an undergraduate, bored of corporate jobs or want to do something out of the box, he or she must go through the important factors before joining a startup. According to most of the entrepreneurs, the victory of business is relied on employees who give dedication and time to the company. In this kind challenging field, you must possess the right set of skills. Before signing a pact with a company, an aspirant must learn the basics needed for performing in a startup. Startups want professionals who have been working in this field for a longer period, to carry out data analysis for the growth of organisation. Collection and analysis of data helps effectively in the operational procedure of any start-up which has just begun functioning or is new to the industry. The information gathered over by using propelled innovation can deliver valuable bits of knowledge regarding to customer needs. Data analysis provides support to a company to make decisions on what is beneficial for the survival in the market and what isn’t and then making conclusions in their strategies accordingly. It depends on the company how they analyse and target these using their products and services. The better they understand, the more they gain. This is a very important skill that every professional must possess. The aim of every individual is to solve the problems quickly and with great sense so that you can please everyone. You need to bring out your own solutions which are out-of-the box and which are not expected so that you built a good image in front of others. Solving your problems independently is crucial to success at any startup and can also help you in fetching promotion. If you are good you can revive your team from any unforeseen troubles in the company. Startups want people who don’t rely on lot of set systems, processes and resources to make things work. You often don’t get what is seen in big budget companies, so you must be able to work with whatever limited opportunities or sources you have. 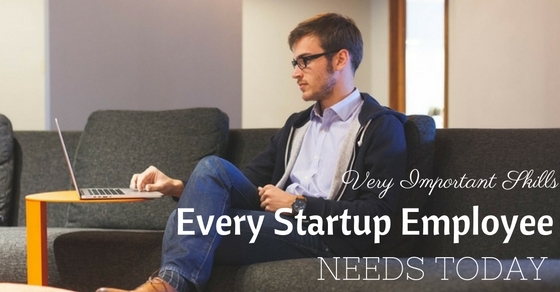 Startups look for people who are speedy and efficient. You must project yourself in such a way that you make an impact on the consumers’ mind. You must have a 24/7 mentality and be comfortable running at 150mph. Make sure that you create your own sales strategy and pitch it in such a way that cater to your goals, especially short term. Setting up a good industry source will help you get in touch with industry experts and gain considerable apprehension. It also gives bigger and wider opportunity. Individuals in the startup group often like to contract workers with deals experience. Numerous new companies at their centre are offering items and administrations to the customer, and there is an awesome requirement for individuals who know how to advance what an organization offers. The issue is that most millennial labourers have a really poor supposition of offers employments, and they keep away from these occupations at all costs. As a startup representative, you ought to realize that deals and tech go as an inseparable unit, and utilizing your business experience as a part of your present place of employment will help you better comprehend what the organization needs. Any individual working in a startup company must know good content writing that will help them making their assignments and presentations. Writing is a very vital element used in communicating. You need to communicate sensibly as your lose and gain depends on the way you communicate. Writing is very imperative in every field, whether it is composing mails or making presentations. All of your work should be your creation as it will give you identity and help you stand with your heads above. Good writing habits can help you frame what you write. You have to learn to express yourself in short sentences so that even the other person reading to listening can catch hold of your thought. As a startup representative, you need to demonstrate that your energy and enthusiasm for the employment is the same or if not, then expanded, since the primary day you joined the organization. Being interested in taking up challenges, is pivotal on the grounds that new businesses continually search for better approaches to create and dependably make utilization of the most recent innovations to get this going. In that capacity, you must be extremely excited about creating yourself, chipping away at your aptitudes and realizing other thing that are to be known. This virtue portrays a man who steps up and can complete things. Your creativity is another way where you can please others and grab opportunities. Constant learning can help your mind built solutions for all the issues and will also help you to move ahead in life. Much the same as in the business world, authoritative abilities are fundamental to achievement. The capacity to organize, sorts out your schedule and work pressure successfully is advantageous for you as well as for whatever is left of the gathering, as it helps efficiency. Employees have to be more swift in their work rate and also adapt to new workplace. But they should also follow the guidelines and complete the work on given deadline. In startups, projects and their deadlines are often unpredictable, they can change at any point without any prior notice. So, the employee needs to be alert and productive all the time. With such kind of workload, where the employee has to always be on their toe, it is very important to work with flexibility and have positive attitude towards work. Being an employee of a startup company if you handle more than one assignment at a time, you have more chances of getting uplifted and promotion is guaranteed. At the point when you start new businesses, you will have to rely upon to take a shot at numerous tasks and most likely more than each one in turn. This implies you should figure out how to deal with undertakings as fast and effective as would be prudent. You have to time your assignment according to your schedule and make sure you complete within the given deadline. A startup environment is often accompanied with uncertainty and lengthened hours that can examine even the workers who have many years of experience and show dedication to their work. Employees without passion and a belief in what the company is hoping to achieve are likely to abandon the ship when the going gets tough. Passion can make you conquer the world. If you have enthusiasm and determination to do something, no one can stop you from succeeding. With passion you also need to have the right decision making quality, to do so you must always concentrate on your work. In startups, unlike other organisations, there is more rapid progress in terms of their work. Similarly, due to less time the workload is also more. to cater to such burden, you must always keep your mind cool and refreshed. Being patient in such kind of workplace is really important as you have to handle a lot of work at one go and don’t even have enough time to think about it. No startup is built in one day, you need to have patience and keep trying till the end. Losing temper can prove to be adverse for the company. No matter what situation you are going through, try and solve it with calmness. It is very essential for an employee in startup to think well. If he thinks well, he can make right decision. As startups work at a greater speed than any organisation, often the employees tend to take wrong decision in hurry. Thinking and analysing over decisions should not be looked over. You have to take a while and think over the decisions whether it will be beneficial for a longer term to the company or just last for few days. One step can lead you to a fall. So take your time, think about the pros and cons and also about the other members as well. Take opinions from others, discuss with your colleagues. A person working in a startup is always going through ups and downs. It is a common phenomenon among startup employees, thus is very important to keep calm all time. One thing you must remember is however difficult the work is, you must never give up. Never give excuses when you could not find solution to something. The best way is staying consistent and not giving in highs and lows. You just need to hang on there for a longer period. The trick is not getting lazy when you are at its peak. At the point when you think of signing in a startup company, sales experience is critical however it is likewise great to know somewhat about SEO. Web software developers are as essential as advertisers, and they ought to spread some of their insight. Understanding SEO techniques, perusing and controlling code, for instance, can be an extremely helpful ability for any individual who is thinking to join a startup, and the best thing is that it’s very simple to do. Right now, there are numerous online assets on which you can look at on the off chance that you need to enhance your SEO aptitudes and also take some special coaching for essential coding lessons. To work for any organisation, it is mandatory to possess positive attitude towards your work. Positive attitude is one of the major quality required to succeed in your goal. Positive attitude is a pillar that supports confidence and encourages you to work efficiently. It helps you to bring in more creative ideas. You are bound to think in development of your work. Positive attitude creates a positive environment around you. Positivity will always lead to prosperity. Well !! Leader are confident, compassionate and competitive in nature. Having a leader within is essential for taking forward a full-fledged company. Working with hundreds of people on same platform with different ideas, needs a person who can cooperate and coordinate efficiently. Power of control is an important factor required to be a leader. A leader should be thoughtful and tolerant towards everyone. Leader should stand out of the crowd but never lose the common touch. For a start-up greatest fear is of failing. As you known that failures are the stepping stones towards success. One should have never give up attitude inside him. He should be strong enough to face failures and must have enough courage to start again with the worn out tools. The word ‘impossible’ should not exists for you and you should have the power to complete your work in any possibility. One should have a passion to reach its destination and never step back with fear of losing. Above given are the startup steps, climb them up and reach your destination. Be confident, and conquer the world! !